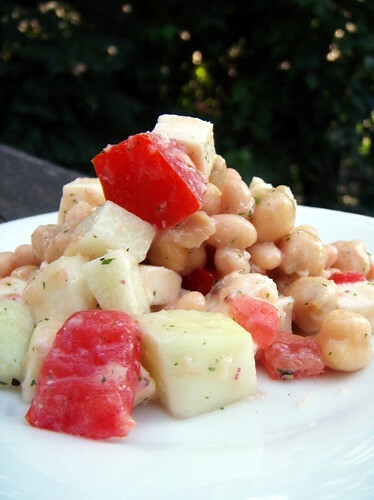 white bean, chick pea, garden zucchini and fresh mozzarella salad, originally uploaded by aarn! +28th August, 2008+. tossed small white beans, chick peas, uncooked peeled and cubed garden zucchini, the meaty part of a few tomatoes, and cubed fresh mozzarella in some ground white beans with a little canola oil, some of that hot vinegar, fresh dill, some seasoned rice vinegar, and salt and fresh ground pepper. took it on a picnic with some pitas and fresh picked berries.